Hey friends, I'm holed up studying for exams again. 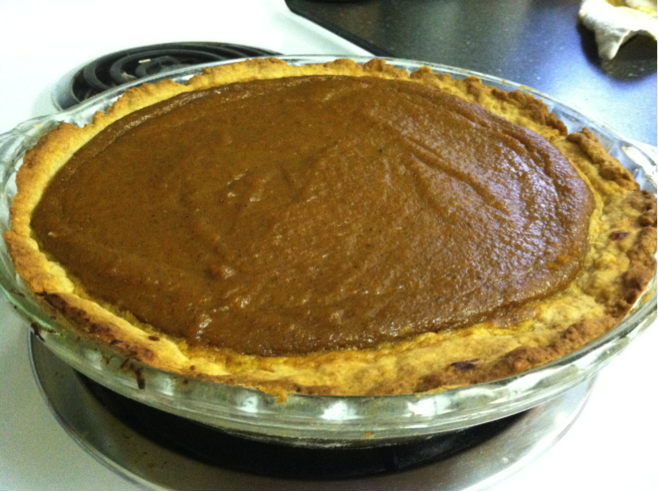 (Tis the season…ugh) My sweet friend Erin once more graciously agreed to guest post for me. 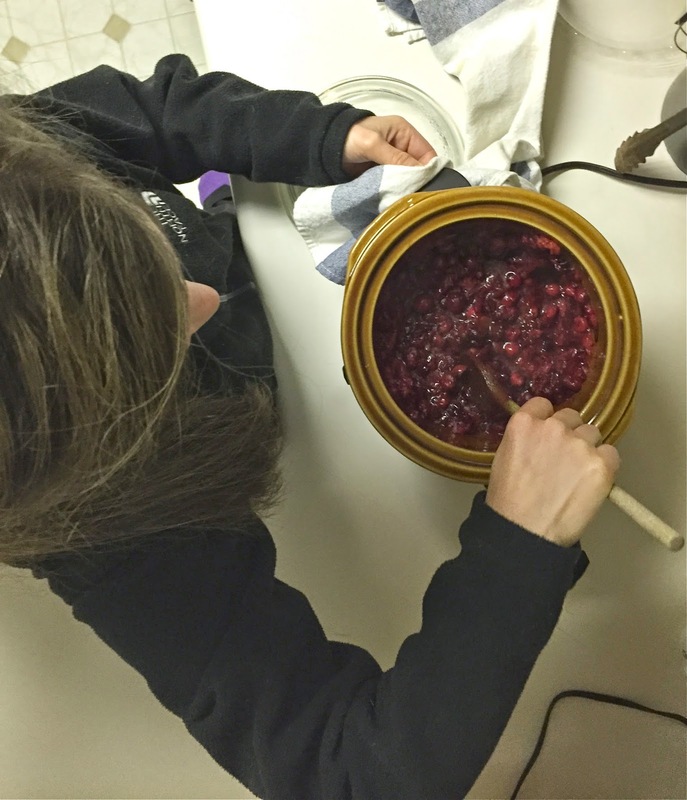 I'm excited to share her easy take on homemade cranberry sauce. It's one of my favorite Thanksgiving foods. 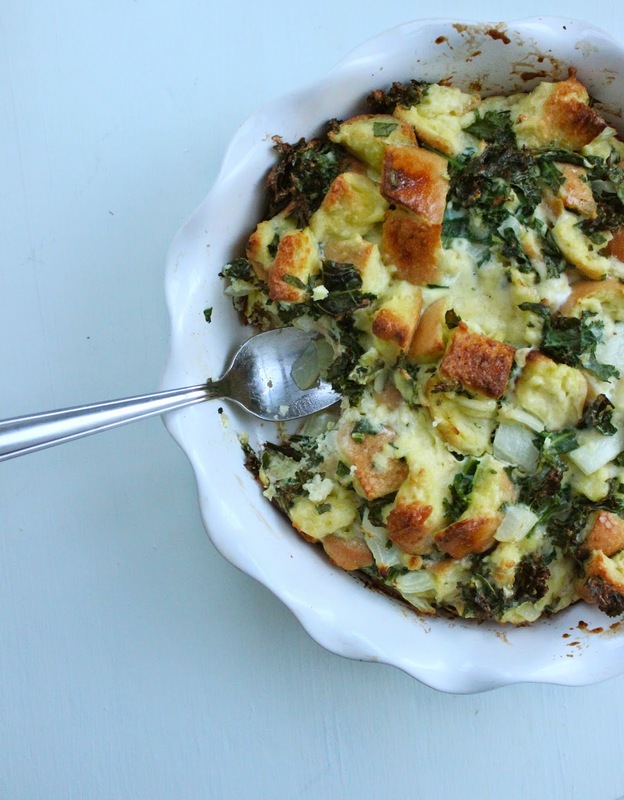 I especially enjoy leftovers for breakfast with some plain greek yogurt and a little honey. Cranberries are in season now, so you can enjoy them beyond the Thanksgiving table. 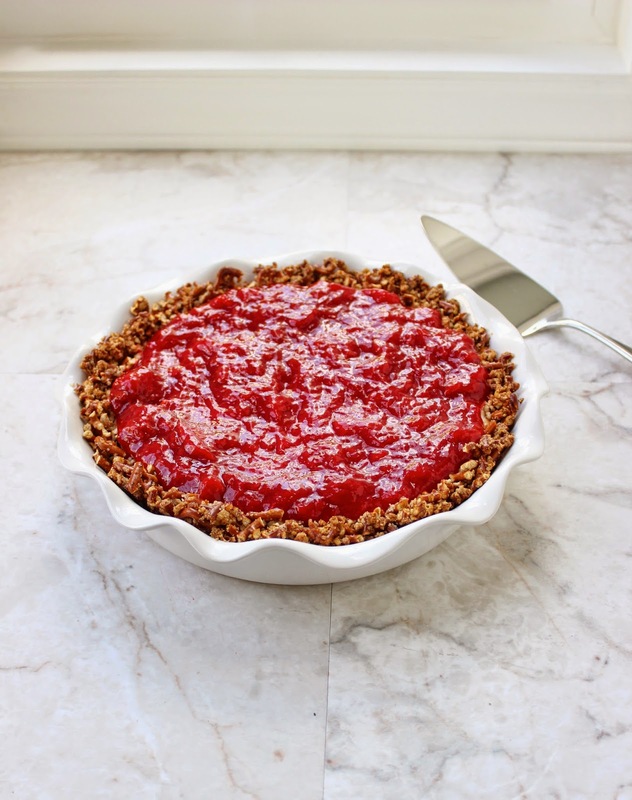 If you're wondering for other ways to use this delicious cranberry sauce, try out some of these: cranberry cornmeal waffles, cranberry gingerbread gelato, cranberry sauce parfaits, and vegan cranberry crumble bars. Enjoy! Thanksgiving is by far my favorite holiday. The food, the family and the laughs all make the day what it is. My parents host Thanksgiving dinner every year. My brothers, aunts, uncles and cousins attend. This year, for the first time, I brought my boyfriend, Harry, to my family Thanksgiving. He is from New Jersey and with only 2 days off from work, the trip from NC was not feasible. I was thrilled that he could join us, but I was also concerned that he would miss his own Mother’s house on this special holiday. I had to make sure we had his favorite dishes on the table so that he would feel as “at home” as possible. I asked him his favorite part of the Thanksgiving meal…homemade cranberry sauce. OF COURSE cranberry sauce is the one thing that is not made from scratch at our Thanksgiving. In fact, I do not think anyone in my family had even tasted cranberry sauce that did not come straight out of a can. Harry loved the sauce. 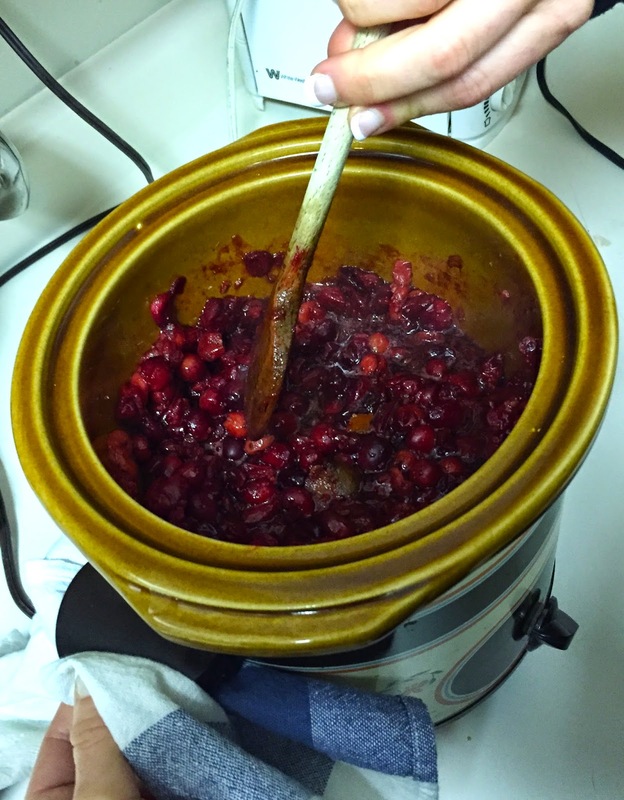 Now we will have a new Thanksgiving dish on our table…goodbye canned cranberry sauce! Wash cranberries. 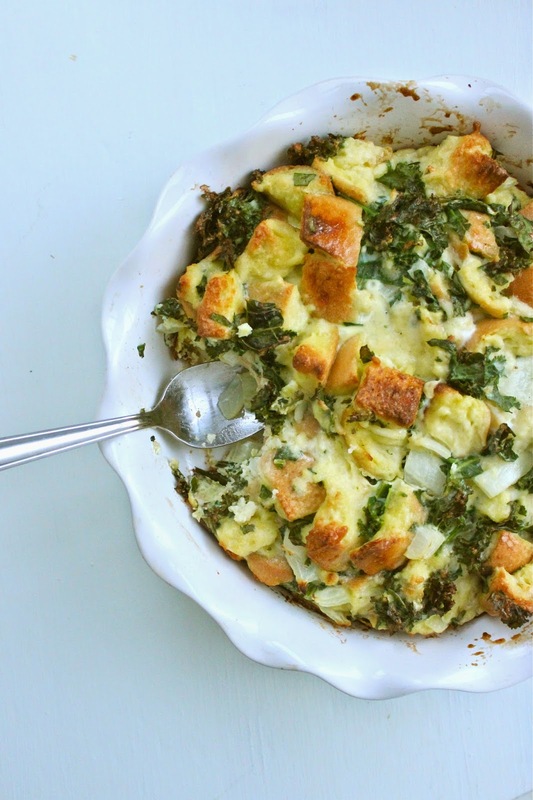 Add everything to crockpot. Cook on high one hour. Stir vigorously smashing cranberries as you stir. Cook for one more hour on high. Remove lid and let cranberries continue cooking on low for 45 minutes. Refrigerate until ready to serve. May be served at room temperature. One of the most fun (and surprising) benefits of blogging has been being part of a virtual community of people that really love food. I still remember the first time someone I didn't actually know commented on my blog, and the first time one of my favorite bloggers commented. I was elated! Now that I've been blogging for a while, I've gotten to witness the ways bloggers support and encourage each other, and it's AWESOME. One ways bloggers do this is by throwing a virtual baby-shower for expecting blogger friends. The first time I saw one of these I was confused. Does the person actually get the treats? Well, no. But they do get lots of support, and exposure, and delicious recipes tailored just for them. 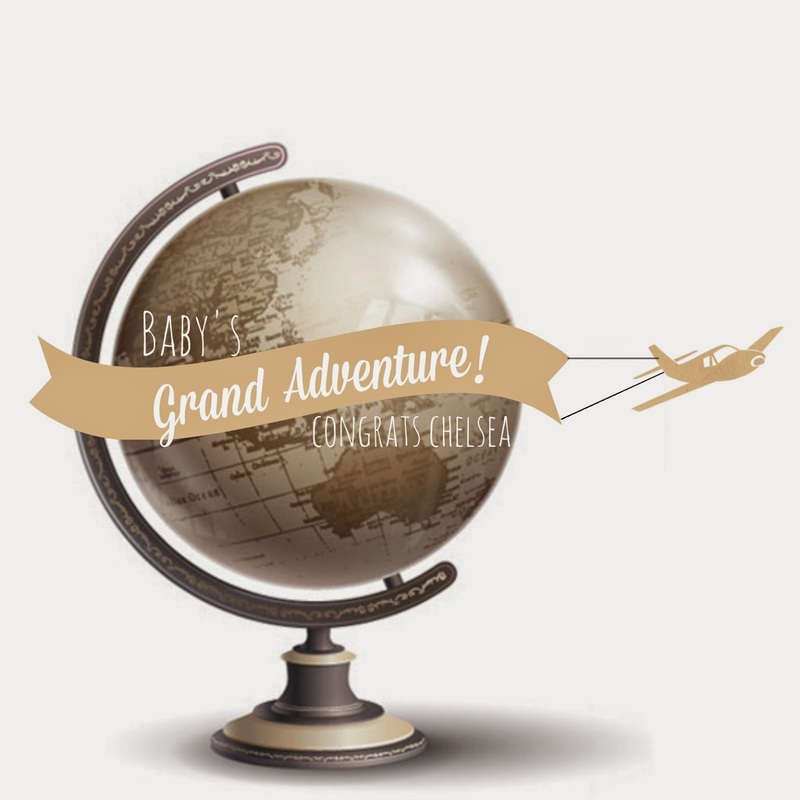 I was so excited to be asked to make a recipe for a virtual baby shower for Chelsea of This Grand Adventure. I've been following Chelsea for about a year now and totally admiring her gender neutral nursery inspiration and cute bumpdates. 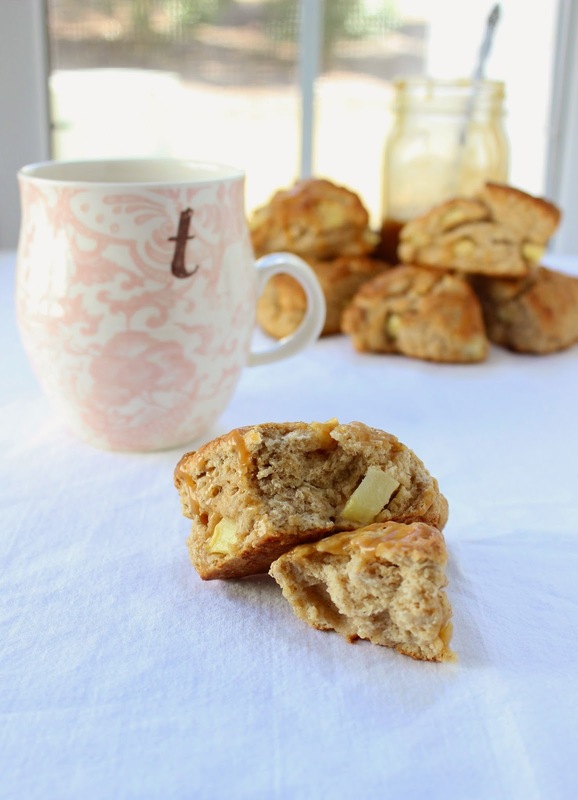 In her last bumpdate, Chelsea shared that she currently can't get enough breakfast food, so I thought these apple cinnamon scones would be perfect. 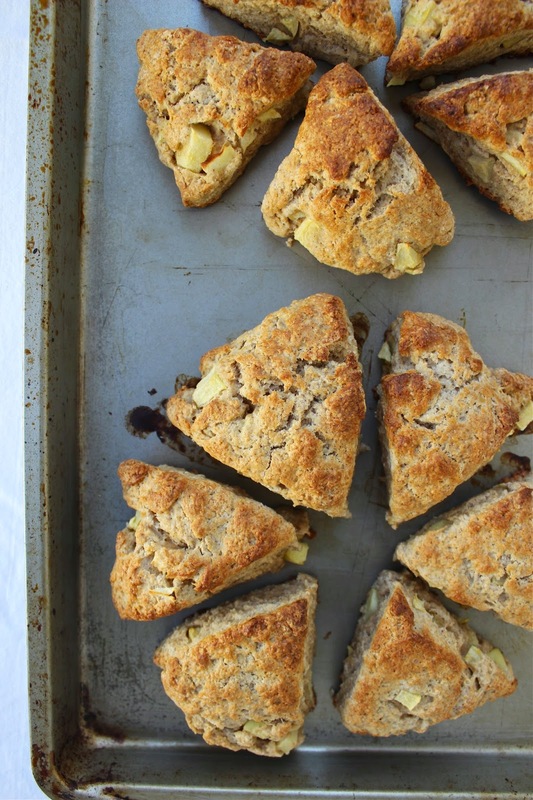 I LOVE the fresh apple in these scones. At first I wondered if I should pre-cook the apple before adding it to the dough, but I'm so glad I didn't. 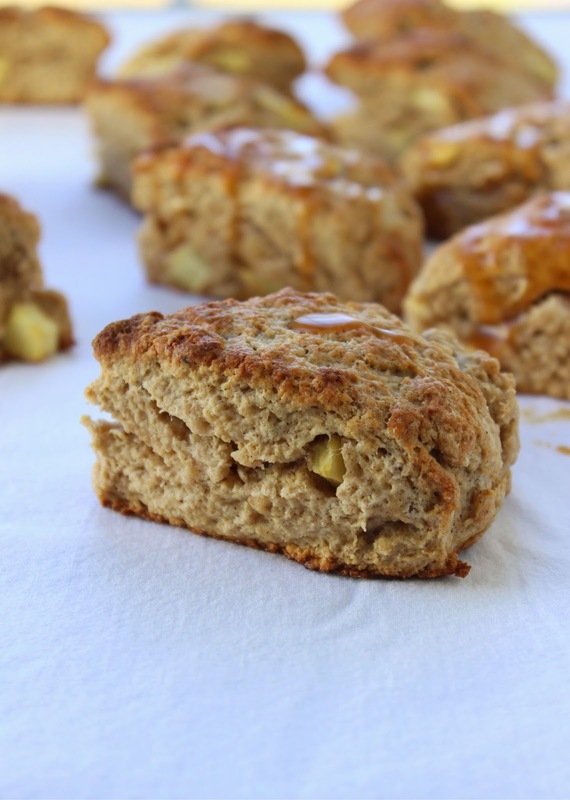 The apple chunks reduce as you bake the scones, leaving these craggy air pockets that are soooo good…. especially when filled with a little homemade caramel sauce. ok, fine, a LOT of homemade caramel sauce. Caramel sauce was once my nemesis. My efforts always involved multiple attempts and lots of burnt sugar in the trash. I was convinced I would never master it. 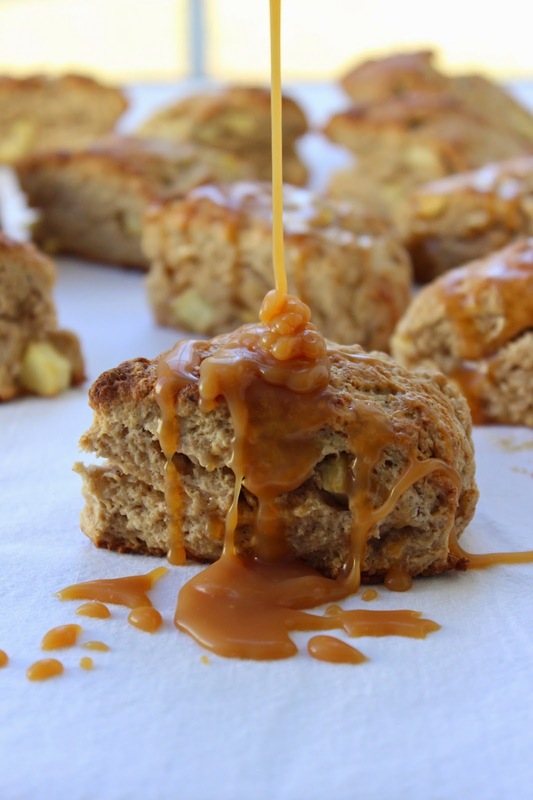 But then last week I listed to the spilled milk podcast episode about caramel. I decided I would make one last attempt. 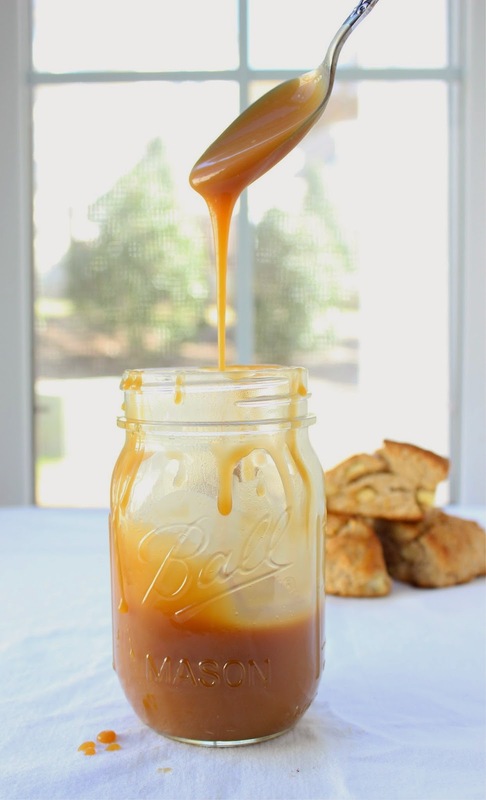 On the podcast, Matthew and Molly share a recipe for dry caramel, which was something I had never tried before. Apparently most pastry chefs make dry caramel, but for some reason most at-home cooks are instructed to make wet caramel. Wet caramel is sugar and water, but dry caramel is just sugar. The wet caramel requires brushing the sides of the pan with water, and a little stirring until the caramel is just the right color. For dry caramel, you just dump the sugar in a pan over medium heat and don't stir it until about half of the sugar is melted. This takes a little bit of time. (maybe 10 minutes?) Then you stir stir stir until it's dark amber in color and gradually add in the heavy cream. I can't make any promises about your efforts with this dry caramel either. It's still an art (or a science, depending on how you look at it) but it is SO worth it. 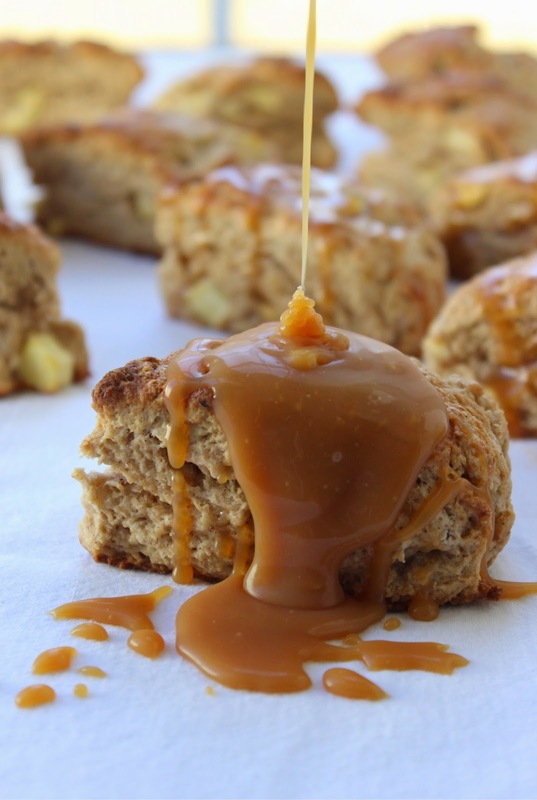 We've loved drizzling this caramel sauce over scones and vanilla ice cream, or just eating it by spoon straight from the jar! 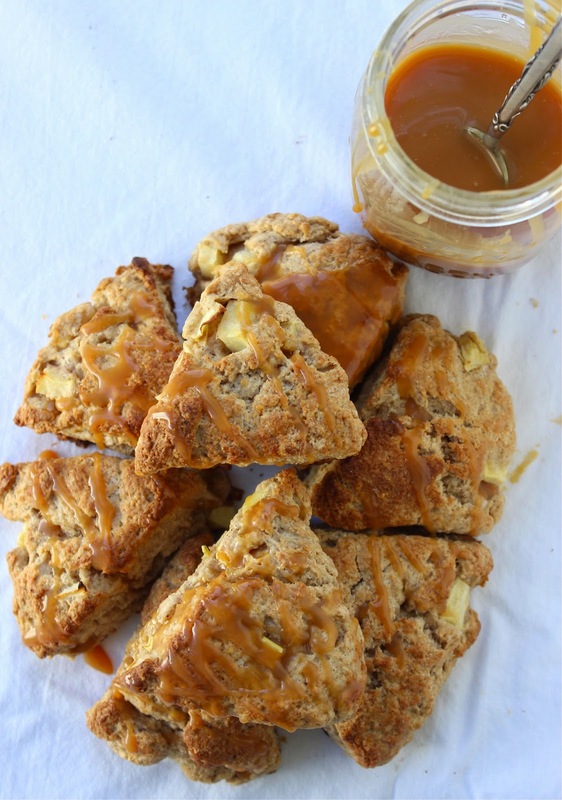 Chelsea, I hope someone makes these scones and this caramel sauce for you, and I wish the best for you and baby D! Whisk together flours, sugar, salt, baking powder, and spices in a large bowl. Add cold butter to the bowl. Use a pastry blender or two knives to cut butter into flour mixture until butter is incorporated and in the shape of small peas. In a small bowl, add eggs, vanilla, and applesauce. Beat with a fork to combine, then add to flour mixture. Add chopped apple. Stir until just combined and no flour remains in the bottom of the bowl. Prepare a cookie sheet by lining with parchment paper or spraying with non-stick cooking spray. Grab about half of the dough and use your fingers to flatten out into a 5 inch circle. Once it's on the pan, use your hand to smooth the edges. There will be pieces of apple sticking out! Just push those in. The dough should be about 3/4 inch thick. Place a small saucepan* over medium high heat. Add sugar. Meanwhile, add the cream to another small saucepan and place over medium heat. Once cream begins to bubble, cover and remove from heat. (This is a tricky stage. If you take the caramel off the heat too quickly, it won't have the luscious caramel flavor, but it you over cook it, it will taste burnt.) Continue stirring and watch as the sugar begins to change color. You can use a spoon to remove a bit of the caramel and put it on a white plate to test the color. It will start out a pale yellow color and gradually get darker and darker. You're looking for a deep amber color. Once it has reached this color, it's time for the cream! Gradually begin streaming in the cream. Stir stir stir! Once all the cream is incorporated and most of lumps are gone, turn off the heat. 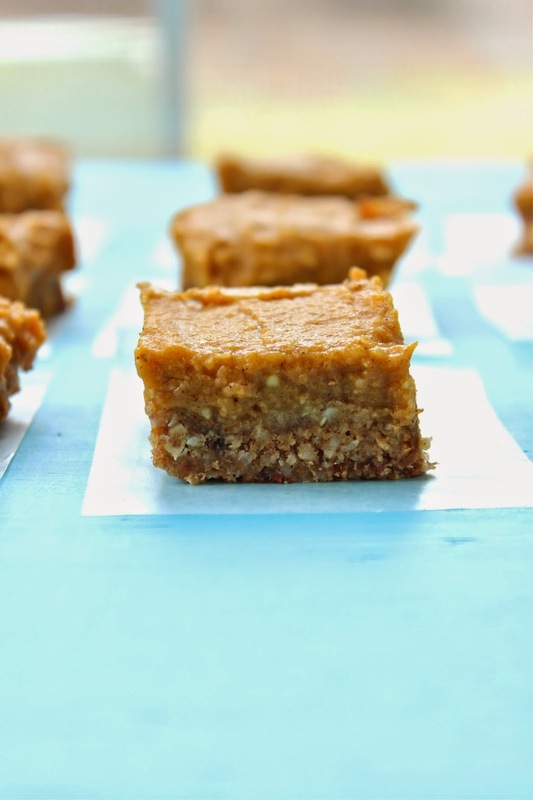 There may be little bits of hard sugar at the bottom--that's ok! Pour the caramel through a fine strainer if you have one. If desired, add pinch of salt, a dash of vanilla, and a sliver of butter. Use immediately (would be ideal for ice cream!) or let cool and then refrigerate in a glass jar or container. 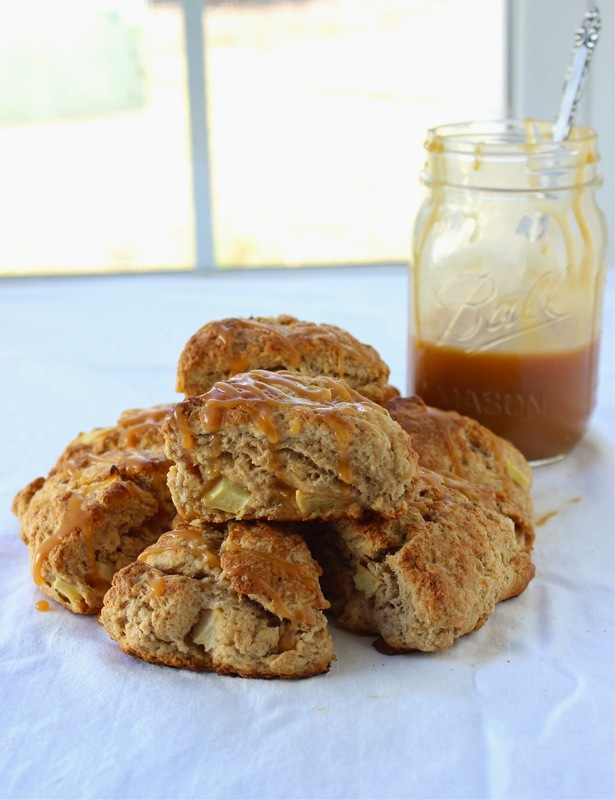 For the scones, we preferred letting the caramel cool or refrigerating it overnight. It will be lovely and thick and drizzly the next day! 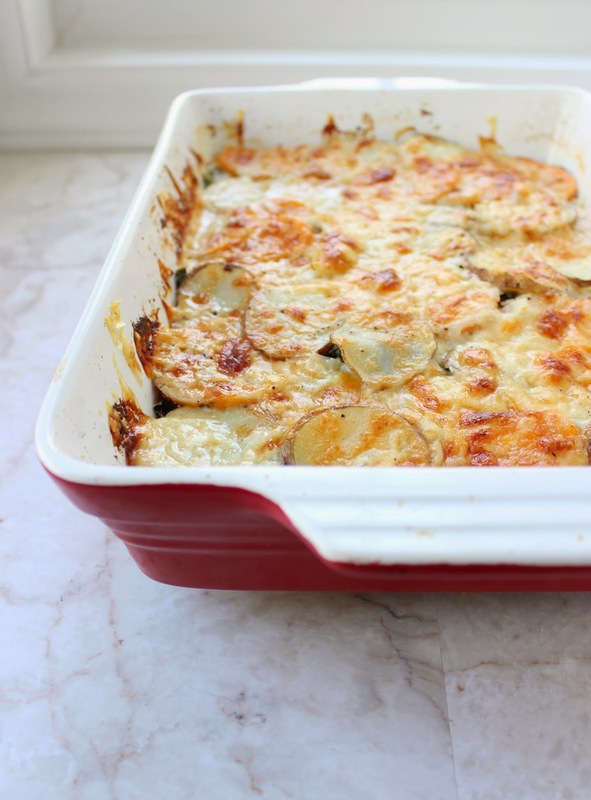 *The original recipe said not to use a non-stick pan, but that is all I have, and mine worked out ok! Well, since Halloween is over, stores have now taken to putting up Christmas displays. This is a little mind-boggling to me, since I'm just now ready to think about Thanksgiving. 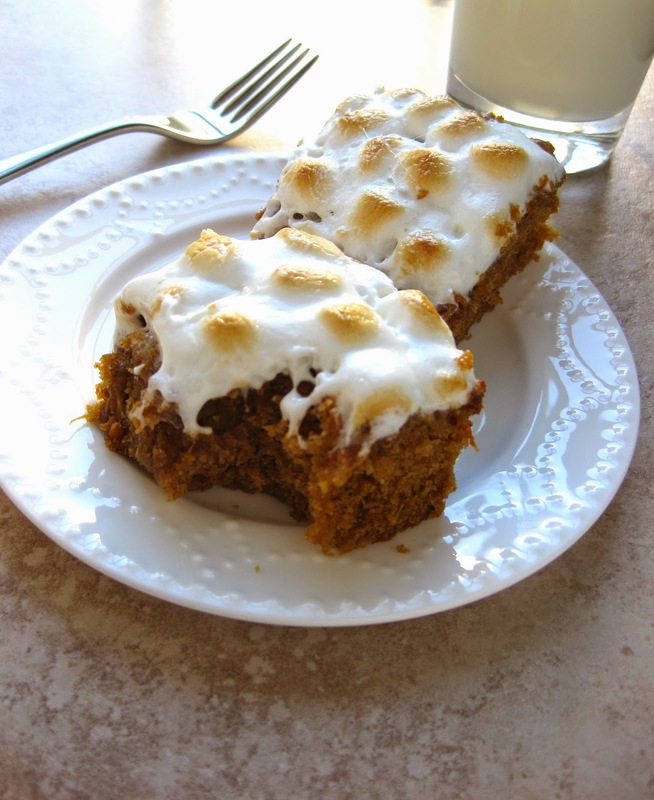 In my view, this is still prime pumpkin time, so I'm sharing just one more pumpkin recipe. 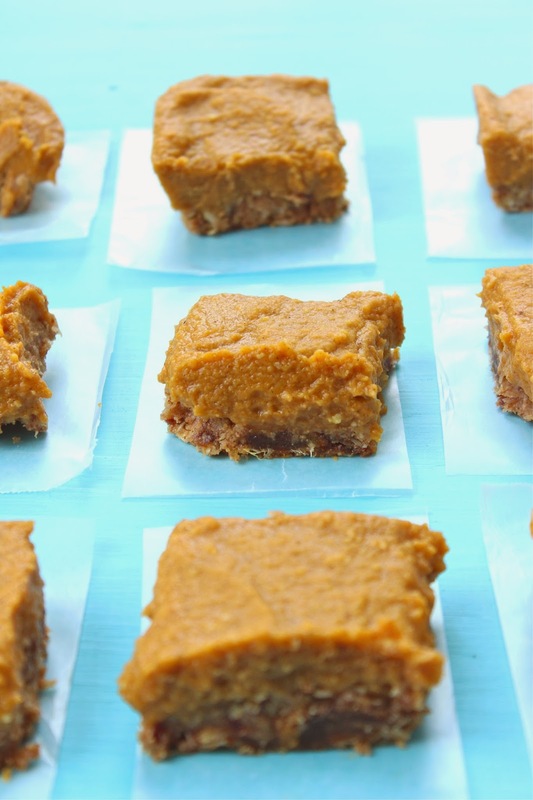 These no-bake pumpkin almond bars are sweetened with dates and pure maple sugar. 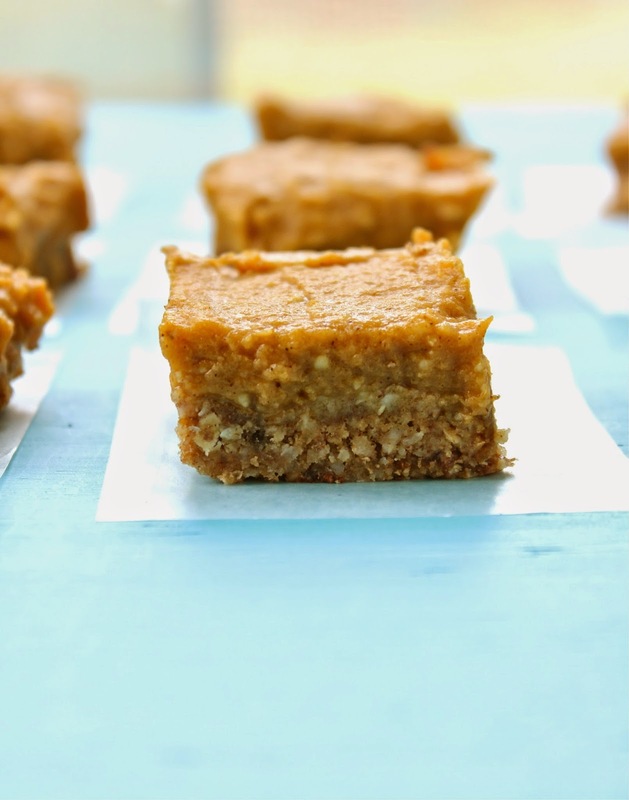 Initially I thought the crust was my favorite part--salty, nutty almond butter & sweet, chewy dates--but as soon as I tasted the filing it won me over. Totalllllly. It's creamy sweet, perfectly spiced pumpkin pie filling on steroids. I'm already contemplating making it again just so I can eat it out of the bowl with a spoon. Maybe pumpkin parfaits? 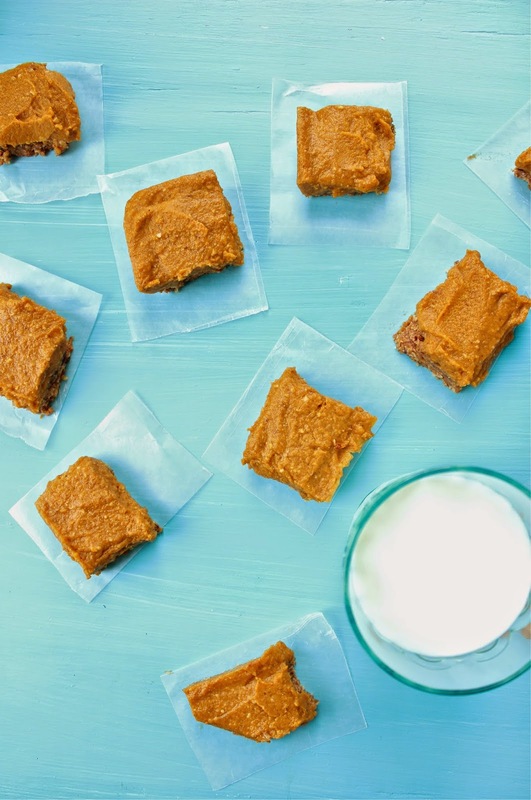 In addition to being naturally sweetened, these pumpkin bars are gluten free and vegan (if you use coconut oil). Though food-processors are a pain to clean, it's the only piece of equipment that you'll need to make the recipe. 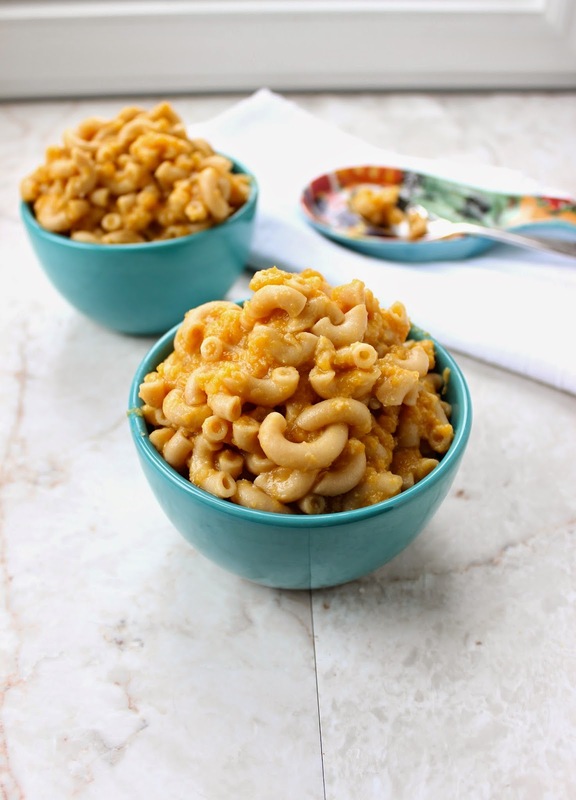 (No mixing bowls or pots!) The hardest part will be waiting the requisite 6 hours that these need to solidify fully in the fridge. Even then, mine were still a little soft, but I stuck them in the freezer for about 10 minutes before cutting. This next month and a half is going to be crazy for me. I'm not really sure how everything is going to get done, but I'm trying to trust that it will all be ok. It will be, right? I make Adam tell me so all the time. I love love love these, especially the speech. There's no denying that I have a lot of work to do the next few weeks, but I don't want to miss the beauty and life still happening around me. How do you stay grounded and avoid the work/busyness epidemic? 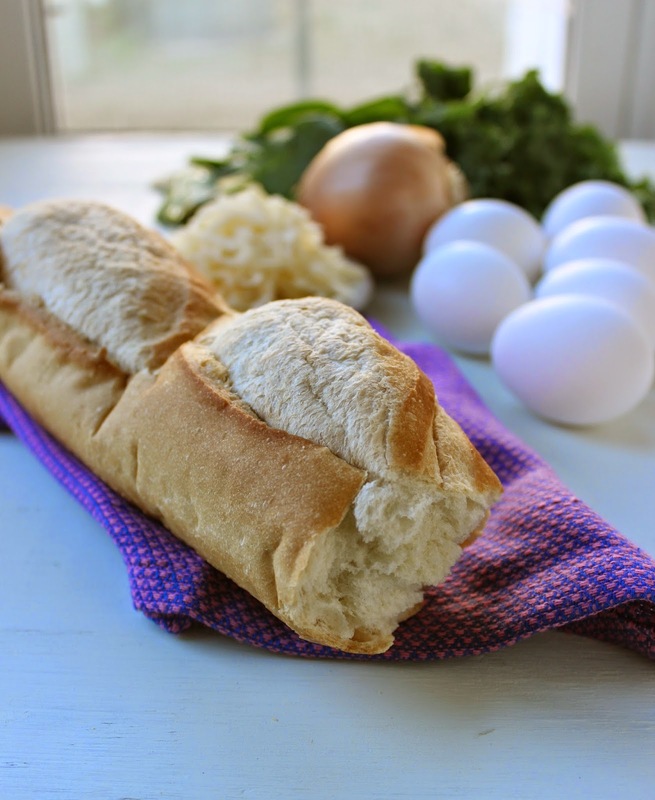 Line an 8 by 8 pan with parchment or wax paper. Add the oats, almond butter, shredded coconut, cinnamon, salt and dates to a food processor. Pulse until mixture is combined. If your food processor is like mine, it might have trouble incorporating the sticky dates into the mixture. 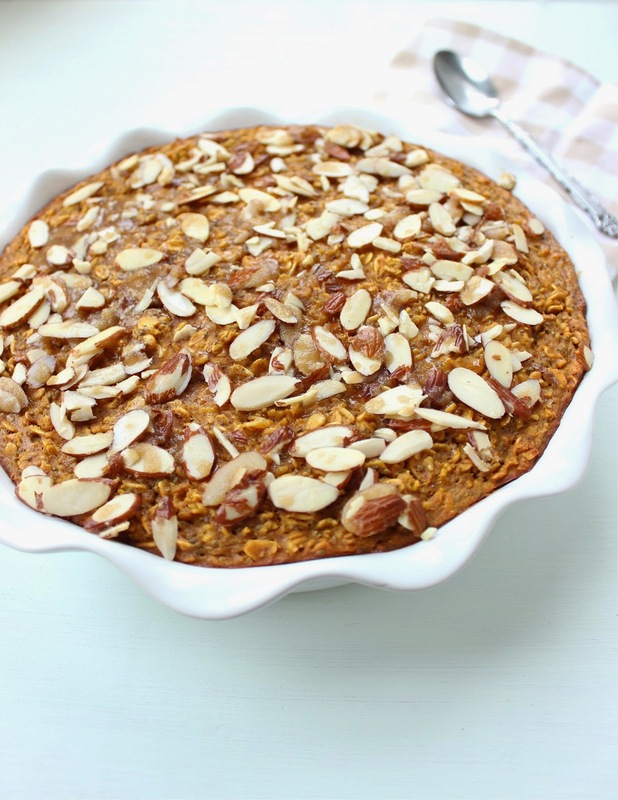 To remedy this, add 1 tablespoon melted coconut oil or butterPour the crust mixture into a square 8 by 8 pan. Use your fingers or a spatula to press the mixture evenly into the bottom of the pan. Place in the freezer while you prepare the filling. Carefully wash the blade and container for the food processor. 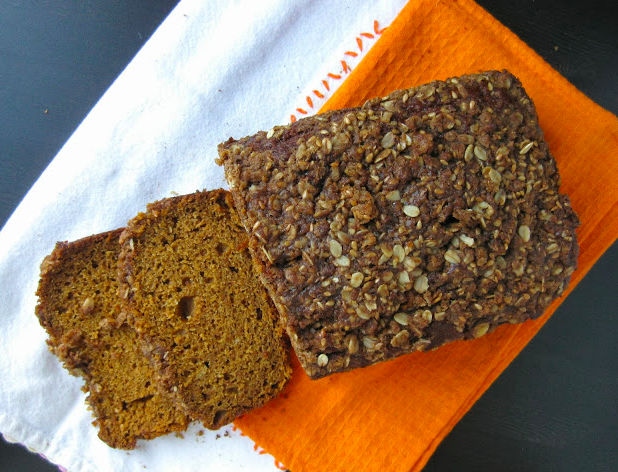 Then add pumpkin puree, maple syrup, melted butter/coconut oil, vanilla, salt, cinnamon, nutmeg, ginger, cloves and almond meal. Pulse until completely smooth. Remove crust from the freezer. Spoon pumpkin mixture overtop. Cover and refrigerate overnight or at least 6 hours. If desired, top with shredded coconut, chocolate chips, or sprinkles! Happy Sunday, friends. 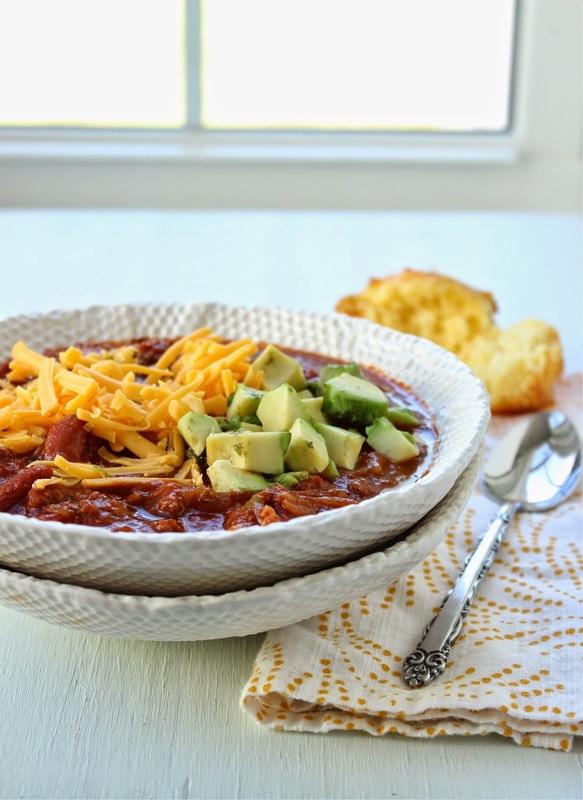 Today I'm sharing my mom's recipe for turkey chili. 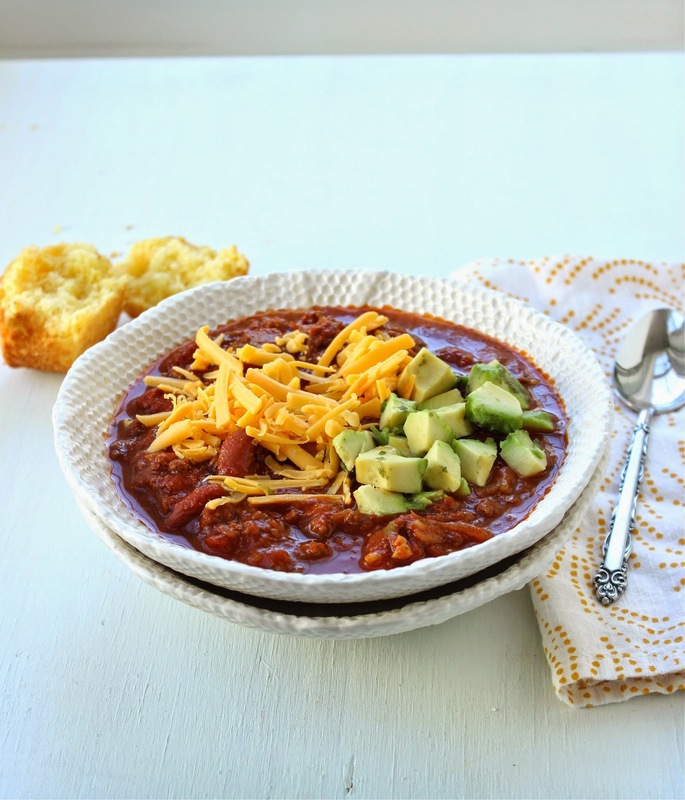 This is a no frills recipe, but I happen to think it's the best chili ever. It won the taste-test award in our church's chili contest several years ago, so it's the real deal. Making: plans for our Italy trip. We're spending Christmas there and I can't wait!! Drinking: lots and lots of La Croix. I'm officially obsessed. Reading: The Happiness Project by Gretchen Rubin. 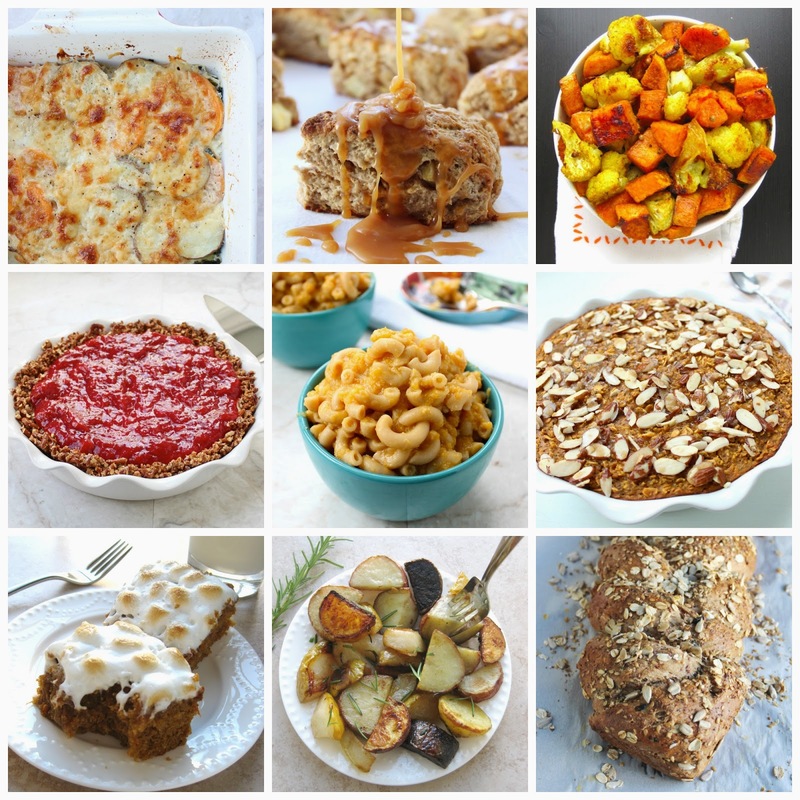 Wanting: all the new food blogger cookbooks--Seriously Delish, Homemade Decadence, Top with Cinnamon, & Date Night In. Watching: Parks and Rec. I love Amy Poehler and really want to read her new book. Listening: to the song "Married Life" from the movie Up. Sob. Eating: chili leftovers and leftovers from this soup I made it for Adam earlier in the week. He wasn't feeling well and specifically requested it. I think it's one of our all time favorites. Wishing: I had more hours in the day. Enjoying: hot tea and candles in the evening. They make me feel cozy. Loving: Saturday afternoon drives with Adam. Hoping: I get to see more of old friends in the next couple months. Needing: more of this fantastic arugula, pear and goat cheese salad with pomegranate vinaigrette that my friend Steph brought to dinner Friday. Feeling: sooo excited about the new blog logo and thankful for my sister who helped me install it. Wearing: this comfy and pretty sweatshirt. Noticing: how beautiful the leaves are. 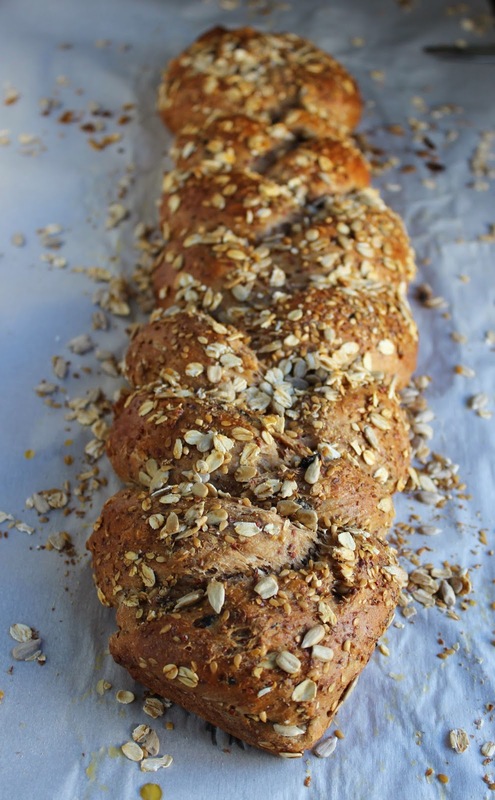 Bookmarking: this overnight pumpkin spice cinnamon roll loaf and this green-lentil soup with coconut milk and indian spices. Add olive oil to a large Dutch oven over medium heat. Add onion and saute for 5 minutes or so or until turning translucent. Add green pepper and cook for another 2 minutes. Add minced garlic and ground turkey. Increase heat to medium high and cook until turkey is browned, stirring frequently. Add chili powder, cumin, cayenne, and red pepper flakes. Stir and cook 1 minute. Add in tomato puree, diced tomatoes, brown sugar, oregano, paprika, and beef broth. Bring to a boil, then reduce heat to low. Let simmer for 45 minutes or longer. Before serving, add kidney beans and black beans and heat through. Turn off the heat and add the lime juice. 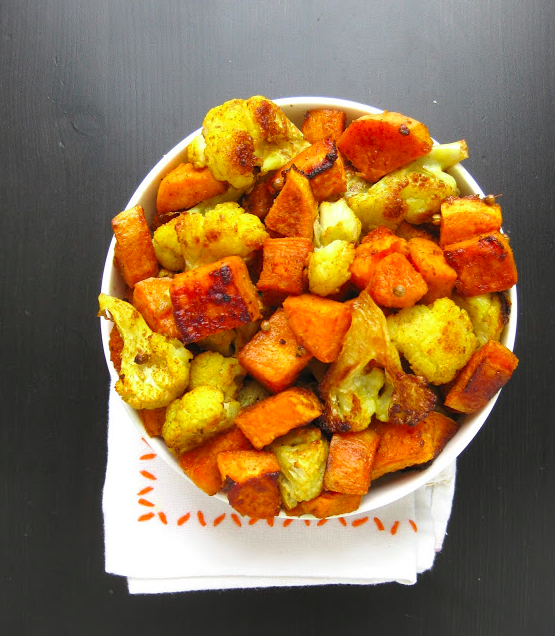 Taste and add salt, chili powder, cumin, or cayenne as needed. 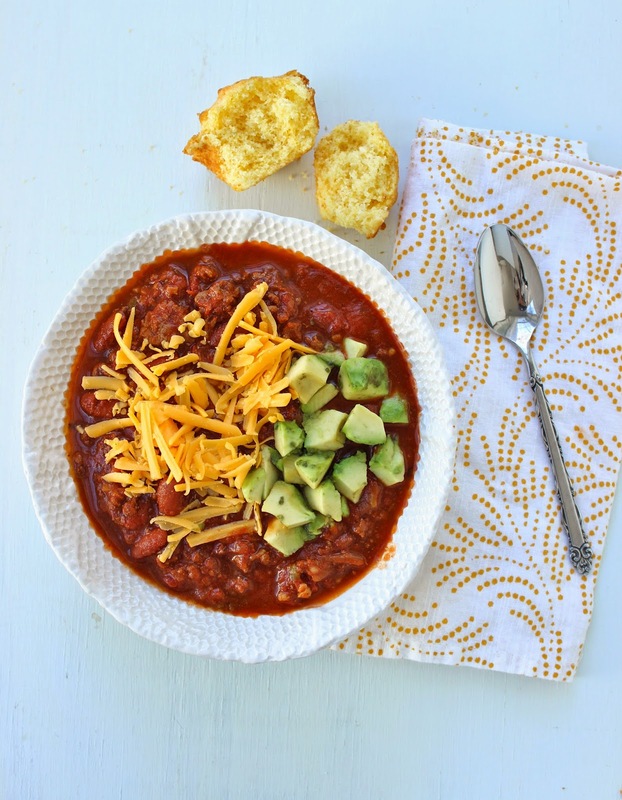 This chili could easily be made in the crockpot. Just cook the meat separately first and then add everything to the crockpot. Cook on low for 7-8 hours or high for 3-4 hours. 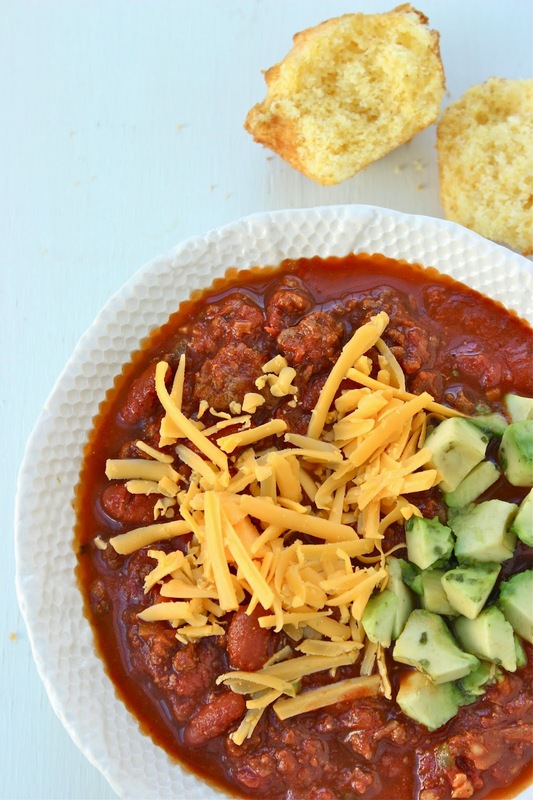 This recipe is for turkey chili, but you could of course substitute ground beef. This recipe also doubles well. Sometimes when I double it, I use 1 pound of ground turkey and 1 pound of ground beef.